Discuss this at our Yamaha FZ-09 Forum. 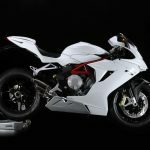 The new model will likely be compete against motorcycles such as the Suzuki V-Strom 1000 and a rumored S1000RR-based model from BMW. 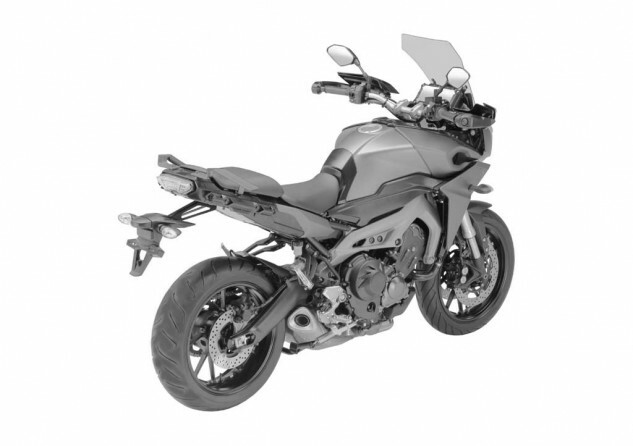 As illustrated from the animated gif below, the new model looks nearly identical to the FZ-09 from the frame down. The handlebars (with hand guards) are higher than they are on the FZ-09, offering a more upright riding position. 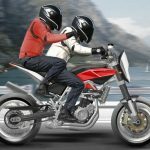 The seat is also higher, with a separate pillion seat along a longer tail section which noticeably offers mounts for saddlebags. 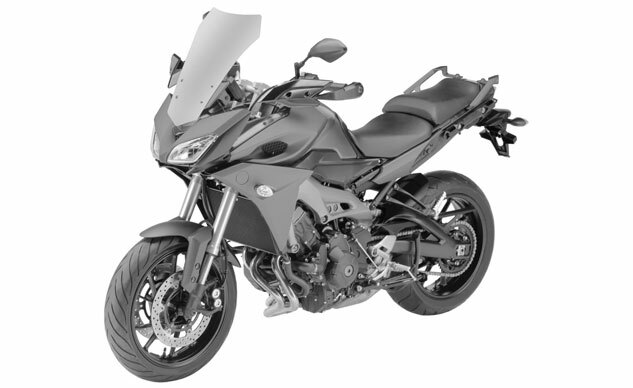 Unlike the streetfighter-ish FZ-09, this new model is intended for traveling longer distances. 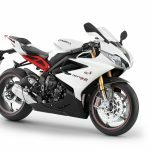 A fairly tall windscreen and minimalist side fairing panels will divert wind from a rider, and a larger fuel tank will offer greater range than the FZ’s 3.7-gallon cell, making it much better suited for touring applications. Another noticeable addition is a center stand. The angle below reveals a large screen behind the windshield, possibly including a GPS navigation system. Beyond those differences, the new model appears similar to the FZ-09, with the same wheels, swingarm and underslung exhaust. The trademark registration does not reveal any indication of what the new model will be called. 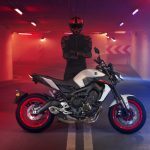 Yamaha will likely look to its past model names, much like it did with the MT-09/FZ-09. One likely possibility is the bike will be called the TDM900, inheriting the name of an adventure-styled model first introduced in 1991. Expect to hear more information about the new Yamaha triple as we draw closer to the fall show season. The new model will likely be revealed at either the Intermot show in Cologne, Germany or at EICMA in Milan, Italy.